Ordered a bunch of fabric samples for a vintage couch and sofa reupholstering project, and this was definitely the best color from the Bella Velvet set. Really soft, but doesn't attract lint and hair like some of the darker colors, and doesn't show dirt like the lighter ones. Been looking all over for this colour of micro suede. ð??? Love this color for an upholstery project. I am recovering a couch that gets daily use in our family room. I ordered samples and we like the color (neutral) and the durability. The fabric seems to be the right weight to work with. The fabric is soft and durable. It will be used to reupholster a sofa and chair. Nice quality and beautiful color. I have a sofa with this fabric! Washable, light enough to be easy to sew, and looks durable along with a great price with free shipping. Friend of my, recommend, very good. Is this good to reupolster a couch with? BEST ANSWER: I would say yes! I used it to make new cushions for a glider chair and ottoman. I did it in the winter and it has held up great. We are very pleased with the color and fabric. This chair gets a lot of use and this fabric is doing a great job. I found the fabric easy to work with as well. Yes, this is a durable upholstery fabric that would be great for a couch. Should I wash this fabric before I use it? No. You don’t need to wash it. 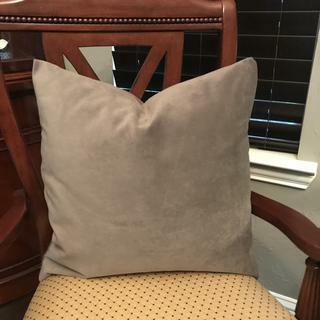 Would this be a good color fabric for the back of a throw pillow if I use iman sultana velvet smoke fabric for the front? BEST ANSWER: We think that would look great! If you're unsure, we suggest ordering a sample of each. Would this be a good choice to recover a recliner that has a bustle back? Thinking about the fabric backing fabric being stiff. BEST ANSWER: It should be fine, the backing isn't too stiff. If you're worried about the backing we recommend ordering a sample to see for yourself! Does this fabric have a sheen to it? BEST ANSWER: No, this fabric is matte. We recommend ordering a sample to be sure that it will work for your project. I have a large sectional that I want to have recovered. Can this fabric be railroaded? BEST ANSWER: Railroading refers to the way a pattern is printed on a roll of fabric. Since this is a solid fabric, there is no pattern. You should be able to use this to reupholster your sectional just fine! 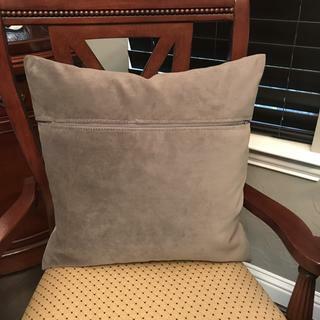 I began sewing again after the loss of one of our fur babies and this was the first time installing a zipper onto one of my pillow covers I make. 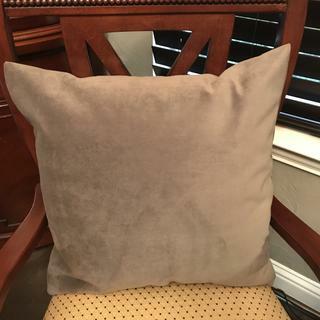 I love the super soft, easy to use fabric that is neutral enough for any décor.